StudyResult - Software for Simple Calculation of p-values and Confidence Intervals. Example from Planning a Clinical Trial. Planning a clinical trial using results from publications. A clinical trial is planned to study the effects of a new drug for treatment of patients with chronic heart failure. Of special interest in this trial is the possible change of neurohormones after 40 weeks of treatment and the plan is to make a comparison with placebo. For ethical reasons, the new drug and placebo will be added to a drug already approved and on the market for the treatment of heart failure. One of the most important neurohormone to study in this trial is aldosterone. To gain some knowledge about what effect would be clinically relevant and what variation one would expect, a literature review was started. 1. Calculation of p-value and confidence interval. In one of the early publications of the effects of the existing drug, a table with descriptive statistics for neurohormones was found. The arithmetic mean and the standard deviation of the change in aldosterone were presented in this table. No statistical analysis had been performed. It was considered informative to check post-hoc if the difference in change between the treatment and placebo was statistically significant and to get an interval estimate of this difference, since this information was not in the publication. Open the File menu and choose New Calculation. 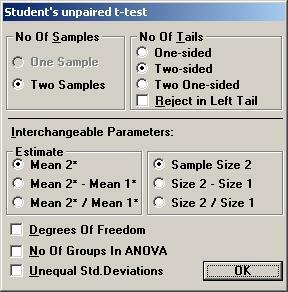 Choose the option button Two-sided and among the Interchangeable Parameters options Mean 2* and Sample Size 2 and press OK.
A screen with the parameter values needed for Student's unpaired t-test is shown. 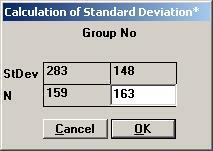 Tick the input box for Standard Deviation* to calculate the pooled standard deviation for the t-test automatically. Enter the values for the standard deviations for sample 1 and 2 and press OK. The value 224.824 is shown in the input box for Standard Deviation*. Set the other parameter values except for p-value as shown, and then press the p-value button. The textbox for P-value will then show the value 0.26681, i.e. there is no statistical significant difference between the treatment and placebo. Choose the option buttons Two Samples, Two-sided, and Conf. Interval. Choose mean (std.dev. unknown) as the parameter to be analysed. 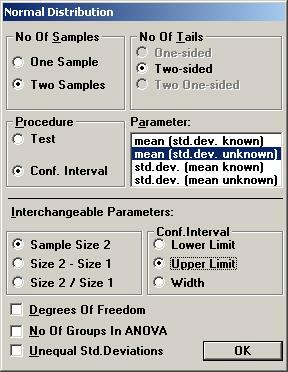 Among the Interchangeable parameters choose Sample Size 2, Lower Limit, and press OK. If no other parameters have not been used, the same values as before are shown for Standard Deviation*, Sample Size 1, and Sample Size 2. Set the values for Confidence Level to 0.95 and Mean2* - Mean1* to -28 (i.e. 32 - 60) and press the Lower Limit. The textbox for Lower Limit will then show the value -77.533, i.e. the left endpoint of a two-sided 95% confidence interval. To calculate the right endpoint, tick the Upper Limit option on the options dialog box and press OK. If no other parameter has been used, the Lower Limit value is automatically changed to the Upper Limit value, 21.533. Thus a 95% confidence interval for the difference in mean change between treatment and placebo is [ -77.533, 21.533 ].